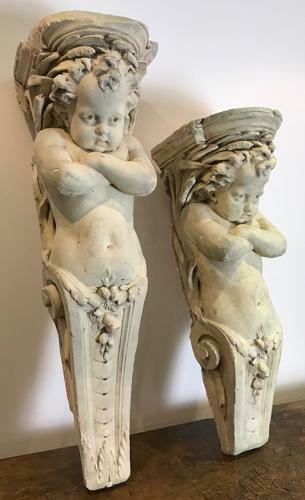 A large pair of 19th century plaster Cherub Corbels. These are solid plaster and would have come from an old Theatre. They are a pair but the smaller one has had restoration at the bottom where it was damaged at some point, so is shorter. The smaller one is 78cm high x 24cm wide x 29 deep. Very nice quality. Price is for the pair.